Only by touching God, can we experience permanent peace. How to touch the Divine ….. through Wisdom. Touching the Divine with wisdom gives Bliss. The Vedas glorify the worship of Agni, fire. Agni is verily Narayana. The first sound of the Vedas is Agni. Swami told me, “You have come taking the first word as your form.” The Vedas emerged from God. The Vedas emanated from the inhalations and exhalations of the Divine breath. They were heard by the sages who lived lives of righteousness, never slipping from the path of truth. Fire is produced by striking two flints or by rubbing two sticks together. Where is this fire? It was latent in wood. Fire appears through the action of rubbing the sticks. 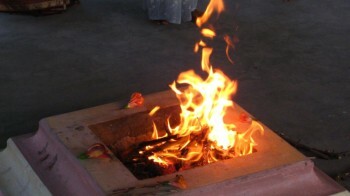 The fire latent in the wood emerges by rubbing two sticks together; this is then used in yagna. The first sound of the Vedas is Agni, heard directly from God. 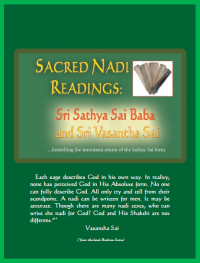 Swami says that the Vedas emanated from the inhalation and exhalation of God. How does one qualify to hear the very breath of God? Swami answers this question in Sutra Vahini. …they can be heard only by venerable sages who have attained knowledge about the Infinite Brahman and who have lived lives of righteousness. The Vedas can only be known by the one who possesses the above qualifications. What are the Vedas? What is their role in the life of man? It is to regulate human life through the light of wisdom. The Vedas can free us from grief; relieve us from the cycle of birth and death and bring to mind long forgotten wisdom. The Vedas counsel and guide man to know Truth; it is Brahman that exists as the ‘I’ or ‘Self’ in every individual. However, due to the false attachment to ‘I and mine’, delusion veils man and he remains in ignorance. It is Brahman that exists as the ‘I’ or ‘Self’ in every individual. However, due to the false attachment to ‘I and mine’, delusion veils man and he remains in ignorance. Each man is Brahman. Each man is a walking Veda. There are not only four Vedas. Every human being is a Veda. The scriptures alone do not contain the Vedas; everything in Creation is a Veda. Every man, animal, bird, insect are verily ‘walking’ Vedas. The trees, mountains, oceans, seas, rivers all are Vedas. They are direct proofs of Truth. They counsel and guide us. Yet, oblivious to this, we live in ignorance. Those caught in the world of illusion and ignorance cannot see the light. God’s voice has to be heard emanating from everything. This is Veda. Wisdom is Veda. Please understand that this Veda Maata, the Mother, has come only to rescue man. Let us look at Agni further. One cannot see the fire latent in the wood. It is only when two pieces of wood are rubbed together that the fire emerges. The same applies to butter in milk. It is only when milk is churned that butter floats to the surface. In the same way, the Indwelling Lord cannot be seen externally. He exists within the heart cave in the form of a tiny blue spark. In order that the Indweller reveals Himself, the mind should be churned. One should watch thoughts each and every moment and transform himself. ‘Churning’ means transformation. The fire of Brahman emerges as a result of this churning. In order that the Indweller reveals Himself, the mind should be churned. One should watch thoughts each and every moment and transform himself. The fire of Brahman emerges as a result of this churning. One should live life never wavering from truth; observe truth in thought, word and deed. One should live life for God alone. Churning the mind requires being in a state of continuous self-awareness, where not even a single wrong or evil thought arises. Swami often refers to me as fire flower. He calls me a fire flower because ‘I touch nothing and nothing touches me’. Fire is symbolic of purity. It signifies sacredness. Mother Sita passed the test of fire proving her purity. I purify every moment of my life as if entering fire. My whole life is yagna. I offer my feelings as the samiths to the fire. Each feeling is consigned to the fire. What are these feelings? They are the thirst for attaining God. This endless thirst becomes my feelings. I express my feelings in many different forms of writing. To make them suitable offerings to Swami, I purified my senses, mind, intellect, ego, everything and merged with Swami at Vashista Cave. Swami called this the state of Sudha Sathwa, pure consciousness. I am performing this sadhana every moment with total awareness. This is a penance of fire. It is the fire of separation. The grief of separation from God scorches me like fire. Right from birth, the fire of separation consumed me. I performed Panchaagni tapas twice. My body is eternally fire. Every life or object in the universe has five qualities or states: Asthi, Bhathi, Priyam, Roopa and Nama. Bhathi or luminescence is the light of the soul. If this light is seen in all names and forms, then one will realize that the universe is verily a manifestation of God. But man gets entangled in a world of names and forms. Asthi – immortal existence, is-ness, Being. It is the Atma. Bhathi – radiant light or luminescence. That which makes an object knowable is Bhathi. Priyam - that which makes a thing or person dear to us. It is love or attractiveness. Asthi is the state of Being. Bhathi is luminescence, the capacity to enter and illumine the intellect. Priyam is attractiveness. These three are the nature of God. When name and form join these three, the universe takes form. Asthi, the Being state is Sath. What is Bhathi or luminescence? What is this capacity to enter our awareness or intellect? It is the light of the soul. If this light is seen in all names and forms, then one will realize that the universe is verily a manifestation of God. But man, who is the reflection of these three qualities, gets entangled in a world of names and forms. He is born again and again caught in the illusion of ‘I and mine’. The luminescence inherent in objects and people attract him. In his quest to possess them, he showers love on them. The lack of discrimination becomes the cause for his destruction. Man’s ignorance hides God and causes attachment to people and objects of the material world. This Vasantha Agni has come to remove this ignorance by kindling the fire of wisdom. My Agni nature reveals this wisdom and shines forth. This is Jnanagni, the fire of wisdom. I am born here to burn all the ignorance and karmas of the world with the fire of wisdom. When a yagna is performed invoking a specific god, Agni deva carries the offering to that deity. This Vasantha fire makes this universe an offering to the Primal Soul, Bhagavan Sri Sathya Sai. One Vasantha Agni, becoming Vasanthamayam Agni, makes itself as the sacrificial offering to God. Here Agni itself becomes the offering. The love for the Atma or Self is the basis for everything. Love arises for all due to the Atma in them. Swami said that Radha is the mirror image of Krishna. The love of Radha and Krishna is supreme. Swami says I am His mirror image. This love is not physical. It is the Supreme Atmic principle. It is the one Atmic principle that functions as two. Ordinary or worldly love is not real. The love for the Atma or Self is the basis for everything. Love arises for all due to the Atma in them. Ordinary love for another is not real. Man longs for bliss and love thinking that he can derive it from another. In truth, love flows from ones own Self to another. Here is an example. A man thinks he derives happiness from his wife. In fact, it is the bliss of the Self he is enjoying and has nothing to do with her physical form. Due to his delusion, attachment and affection arise. As a result, he weaves a web of love around his family. The husband, wife, parents, children and relatives are all in the web. If one is able to come out of this Maya web of body attraction; if he realizes that bliss comes from the Atma within, He will experience true joy. The bliss of the Self, returns to us from another. For example, when we throw a ball against a wall, it returns to us. If our Atma enjoys bliss by perceiving the all-pervading Atma, then we will get bliss from each and every aspect of creation. This is what Radha experienced. This is known as reflection. Creation is a reflection of Krishna. If this Atmic principle is clearly understood, that God and His creation are one, it is bliss everywhere. If one is able to come out of this Maya web of body attraction; if he realizes that bliss comes from the Atma within, He will experience true joy. I see Swami everywhere. I am doing sadhana so that everyone can realize this Atmic principle. It has no relation to the body. It is not the web of limited attachment or ordinary human love. It is Supreme love for the Omnipresent God. Supreme love assumes the form of Supreme wisdom and the gates of Truth open one after another. The first Sutra teaches an important lesson. What is that lesson? One who devotes his life to earn the knowledge of the Atma must himself possess holy virtues. Virtuous discipline and character is power. Those who lead a virtuous and disciplined life will never come to harm. They are endowed with sacred merit. Virtuous discipline and character is power. Those who lead a virtuous and disciplined life will never come to harm. They are endowed with sacred merit. After securing the qualification of virtuous living first, one should proceed to know the Brahman. Swami refers to my virtuous life, since birth itself, by calling me Agni. How would it be if the very first sound of the Vedic verse ‘Agni meeley’ were to take birth as a human? Would it not consume everything other than virtue, good conduct and chastity? This is the essence of the first Sutra. The inquiry into Brahman can begin only when one has lived a virtuous life.